Exciting news for everyone involved in and interested in women’s hockey!! Breaking the Ice by women’s hockey star Angela Ruggiero has just been released on Amazon.com and will soon appear in national bookstores. 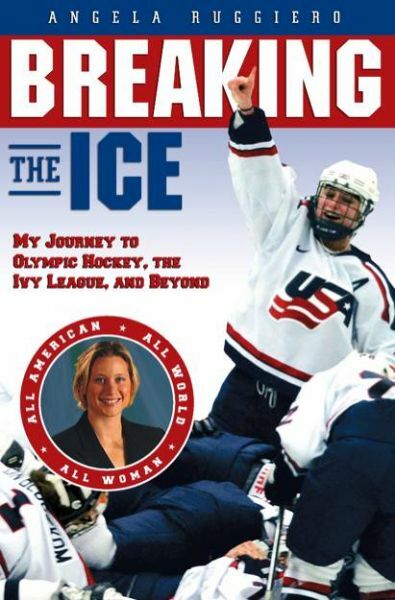 Ms. Ruggiero has been named the best women’s ice hockey player in the world by Hockey News magazine and this is the first and only book to relate the story of her life and sports career. Without exaggeration, Angela’s record in her sport rivals that of any active athlete. She has played in six consecutive world championships for Team USA, will play in her third Olympic Games this February in Turin, and was a four-year star at Harvard University. Amazingly, she is one of the very few athletes ever to be on championship teams at the college, international and Olympic levels. Many commentators consider her to be the best player ever in her sport. In addition to her brilliant sports record, Angela has excelled academically and has been involved in numerous humanitarian and charitable causes. She is a champion of women in sports and has founded the All-American Girl’s Hockey School. Breaking the Ice is an inspirational story for all girls and women who are striving to succeed in sports, school, career and life in general. Angela has always aimed high even in situations where her chances of success seemed slim. She overcame the strong resistance to girls in youth hockey and helped shape the rapid rise of the popularity of the sport for women. there snacks today?" "Whaaaat?" I barked exasperated. "Did anyone bring snacks today?" "Huh," I looked away. "I hope they didn't bring apple juice." The young boy said. "I don't like apple juice." The moment froze me in all the playoff excitement, the way all special and meaningful moments should. If somehow, I could have captured that conversation on tape, I would have had one of those special sporting moments for parents everywhere, the kind you need to play for coaches and executive and trainers and managers and all of us who take kids hockey way too seriously. It isn't life or death, as we like to think it is. It isn't do or die as often as we pretend it to be. In one tiny moment in one game minor hockey was reduced to what it really is about. Apple juice. OK, so it's not apple juice. But what apple juice happens to represent in all of this. The snack. The routine. The ritual. Kids can win and lose and not even give a second's thought about either, but don't forget the post-game drinks. If anything will spoil a good time, that will. killing time on a losing team rather playing sparingly on a winning team, and the answer has already come out in two different studies. Overwhelmingly, kids would rather play a lot than win and play a little. experience. You can't know what's in a kid's mind. I was coaching a team a few years ago when I got a call from the goaltender's Father. It was the day before the championship game. The Father told me his son didn't want to play anymore. "Anymore after tomorrow." I asked. "No," the Father said. "He just doesn't want to play anymore." "Did something happen?" I asked. "He won't tell me," the Father said. I hung up the phone and began to wonder how this happened and who would play goal the next day when I decided to call back. "Can I talk to him?" I asked the father. The goalie came on the phone. "I don't want to play anymore." "But you know what tomorrow is, don't you? Are you nervous?" "No." "Then what? You can tell me." "I don't like it anymore." "Don't like playing goal?" "They hurt me," he said. "Who hurts you?" "The guys," he said "What guys?" "Our guys. They jump on me after the game. It hurts me and scares me." "Is that it?" "Yea." "Do you trust me?" "Yea." "What if I told you they won't jump on you and hurt you anymore. Would you play then?" "Are you sure?" "I'm sure." "Then I'll play." And that was the end of the goalie crisis. The kid was scared and wouldn't tell his parents. The kid loved playing but didn't love being jumped on after winning games. You can't anticipate anything like that as a coach. You can't anticipate what's in their minds. It's their game, we have to remember. Not our game. They don't think like we do or look at the sport like we do. They don't have to adjust to us, we have to adjust to them. We have to make certain we're not spoiling their experience. Our experience is important too, but the game is for the children and not for the adults. We can say that over and over again, but the message seems to get lost every year. Lost in too many coaches who lose perspective and who think nothing of blaming and yelling and bullying. Lost by parents who think their son or daughter is the next this or the next that and they are already spending the millions their little one will be earning by the time they finish hockey in the winter, 3-on-3 in the summer, power skating over winter break, special lessons over March break, pre-tryout camp before the AAA tryouts in May and a couple weeks of hockey school, just to make certain they don't go rusty. reminder, I don't care what the age: Don't forget the snacks. Steve Simmons writes a city column for the Toronto Sun when he isn't coaching his Avenue Road minor atom select team or Vaughan peewee house league team. His syndicated Sunday sports column is the most read sports column in Canada. A hockey season provides many months of lessons for the players, parents and the coaches. A team comes together in the fall and over time chips away at the many aspects of the game, which need to be addressed. This group will partake of an emotional journey through practices, travel, bad rink coffee, hot pizza, laughs, tears, injuries, poor directions, broken skate laces, highlight goals, big wins, frustrating losses, report cards, Santa’s visit, cold and flu season, pig piles and Big Macs. This experience will provide all involved with a wide-ranging education ranging from stick handling to discipline to friendship and everything in between. Yes, a hockey season represents a wonderful opportunity for all involved with a wide-ranging education ranging from stick handling to discipline to friendship and everything in between. Yes, a hockey season represents a wonderful opportunity for all involved! represent an indication of progress over the winter months It is vital to understand that any one coaching amateur hockey is doing just that; coaching amateur hockey. Whether they are youth players, high school kids or even college players one must understand and accept the fact that they are young, inexperienced kids who are playing mainly for fun and to get a bit better. these levels to straighten some things out. You do not get to make trades to address areas of weakness and you certainly are not working with pro players whose only job is to play hockey and who may have been playing professionally for many years with outstanding teaching. As the saying goes, it is impossible to be young and experienced. The advantage is what you do get to work with are young, enthusiastic kids aged 6 to 22 years old who want to have some fun, improve and learn a bit about the game. The advantages one has are that these teams usually have a great deal of enthusiasm and energy. They have chosen to play, they want to play, they want to play well and have success. They want to please themselves, their parents and peers. They may not know how to channel this energy and they certainly do not know everything about hockey but neither does any coaching staff. teachers feel that a young person will perform a full concerto on their second or even seventy-second attempt! The goal of any youth coach should be to improve the individual skills of the players. Over months the players should become better skaters, stickhandlers, passers and shooters. There are also various tactical principles, which should be relayed depending on the age of the players. USA Hockey provides quality guidelines and direction through their literature. There are many fine drills and games, which will aid the teaching process. However, as a general rule a coach/teacher should indicate what he would like the players to do, not always telling the team and players what they are doing wrong. If you are always telling them what they are doing wrong then they never really know what it is you would like them to do. They will inevitably become afraid to do anything at all and play tentatively with little enthusiasm and creativity. Remember, the enthusiasm and creativity are two of your strongest assets! lessons to sink in. Quite frankly, a small percentage of your player may never figure out some lessons. They may not possess the mental aptitude or they may not be ‘into it’. Although this is frustrating one must accept reality and move on. brought the group together by maintaining discipline and always seemed to allow some fun in all situations. Granted, this is Hollywood and in the real world there is not always a happy ending but that is also a reality. You got what you got, you do your best and let the chips fall where they may. fifteen minutes to improve their passing? Sounds boring to me. Do you have them shoot against the boards to get a better shot? Sounds boring to me. I believe you must create competitive and fun situations that will keep the young players enthused, engaged and challenged. For example, to work on skating you can put two kids inside a face-off circle and have them play tag without sticks. Allow them to go on for about twenty seconds and then two more jump in. Watch how competitive they will become. There will be all sorts of stops, starts and evasive maneuvers. I have never seen a drill that will address such a variety of skating positions at such a high tempo. The ideal would be to have about eight to ten kids at each circle. You want to match kids of comparable ability and this also works well for goalies and their footwork. This is one example of taking skills such as skating and teaching it through a small game. players will get many meaningful touches with the puck while your goalies will face a variety and quantity of shots unheard of in a regulation setting. Again, I have never seen a ‘drill’ that addresses so many areas of the game, is not predetermined and will foster such a high intensity and engagement level from your players! The simple tag game and a simple cross-ice game are two small examples of harnessing your players’ energy while developing their skills for the game. Our next article will delve deeper into the tactics of engaging players during practice. The first step for a youth coach is the acknowledgement that a season is a journey. The players are young and inexperienced. They may very well be poorly disciplined or possess inadequate skills early on. It is the journey that provides the coach the opportunity to chip away at the group’s inadequacies and parlay this into overall improvement. Yes, it would be easier to make trades but it isn’t going to happen. Is Best Versus Best Always Best? Over the past couple of months it has been our privilege to watch some of the world’s truly elite athletes do what they do best. First there was the Olympic Games in Athens, and as is typical of the Olympics, there were some disappointing performances and some outstanding performances by teams and individuals competing for their country. At times the competition was great and lesser-known athletes were able to upset the favorites, and at times the best of the best easily overpowered their challengers. Next came the World Cup of Hockey, where the best players representing eight of the top hockey playing nations in the world squared off in a tournament to determine who was the world champion. At times the hockey was excellent, at times the hockey was not so great. Some of the games were very competitive and exciting right down to the last second, some were all but over shortly after the puck was dropped. In the end, heavily favored Canada really did not have that much trouble in winning it all. And finally there was the Ryder Cup, where the best American professional golfers hosted the best European golfers in a team competition to determine bragging rights as to who ruled the world on the course. As would be expected with the best playing the best, the level of play was excellent, but unfortunately in terms of competitiveness, the Europeans handled the Americans quite easily and the outcome was pretty obvious halfway through the matches. How much better can it be than having the best play the best? Good question. But an even better question, in my opinion, is why to have the best play the best? To me, even at the amateur hockey level (youth and adult), the "best versus best" concept has some merit, although it needs a significant adjustment in philosophy. Having all players and teams participate at the proper competitive level, not just the best against the best, is one of the most important aspects of organizing amateur sports. Whatever level it is, high level, mid-level, low level, in terms of skill and experience, it is important that players and teams have the opportunity to compete at the level where they can be involved and challenged. Players and teams who are clearly much better, and dominate the players and teams they are competing against obviously don’t belong at that level. Ditto for players and teams who are at the opposite end of the scale. No one benefits from a blow-out, not the better team, not the weaker team, not the better players and not the weaker players. I doubt that there are too many people who would disagree with that. So in an attempt to avoid that problem, teams and players are divided into classifications, which is the right idea and a good start. But from there we get caught up in "being the best" mentality and sometimes I think we forget what we were trying to accomplish in the first place. For example, here in Michigan, AAA hockey is the highest level of play and probably a good idea at the right age groups. But unfortunately we don’t stop there and the "best versus the best" mentality takes over and "being the best" takes precedence over players and teams being competitive at their level. We start to form teams at younger and younger age groups (younger than the earliest allowed age of AAA play) and call them things like "AAA Development Teams" and then we use that "classification" or "designation" as leverage to entice the "best" players to come and play for that team. That in itself is not necessarily a bad thing. Obviously, most players want to try to improve and play at the highest level they can. But it can get out of hand in a hurry. Some coaches, with this "label" as their carrot, tell unknowing parents things like "you better get your kid on this team now, or he/she will fall behind and never have a chance to make it." And there are many parents who just eat up the "prestige" of being able to say that their son or daughter plays on an elite team, ranked team, or whatever the "prestigious designation" might be. Additionally, many people have the misguided perception that playing against better players makes you a better player. Sometimes it is true, many times it is not. It depends on the player, their personality, and the opportunity he or she gets. If you are a "third-line checker" and struggling to keep up at 12 on a AAA team, chances are you are going to be a "third-line checker" at 13, 14 and 15 at that level. If you are still at that level. How can you get any better at handling the puck and creating offense if you never get the opportunity to be in that situation? Actually, it impacts every level. In A and AA hockey, there are always major conflicts and fighting over which teams should be in the "ranked" division of leagues and which teams should not. In girls’ hockey, while there is still no "B" or house league level of play because there are not enough girls playing the sport, incredibly there is a AAA level of play, for the best to play against the best. At the 8 & under level, a totally separate league has been formed so that the best can play only against the best. And yet there are many parents and coaches who do not get caught up in the "best versus best" mindset. To them, youth hockey is a game for kids to play and they are more concerned with the fact that their player and team is competing at the appropriate level, that they are at the same time challenged to work hard and improve and can also have some success and enjoy what the game has to offer. So in the youth hockey arena is the concept of the best versus the best a positive or a negative? To me, it is a positive only when used in the context of having players and teams play at their appropriate levels for the right reasons. But unfortunately, more often than not, it doesn’t end there. It becomes more about the label and what the label can do for you. The prestige for the parents. The recruiting aid for the coaches. The resume-building for the player. Ironically, what started as a good idea to ensure that players compete at their appropriate level to get the most enjoyment out of the game ultimately becomes about everything but that. A former Michigan State Spartans hockey player, Lyle Phair played professionally with the LA Kings and New Jersey Devils organizations, and was a collegiate assistant coach with the UIC Flames of the CCHA. Phair can be reached at .